How is Coffee Decaffeinated and Why Choose Decaf Coffee? | Real Coffee Bag Co.
To decaffeinate coffee beans by-way-of the Swiss water process you must soak the green coffee in water. This will dissolve the caffeine in the beans along with any other soluble components in or on the coffee. A Green Coffee Extract solution is then added to the water and the caffeine in the water is absorbed into the GCE solution. This solution (with the absorbed caffeine) is then passed through carbon absorbers that remove the caffeine molecules from the GCE. This process is repeated on loop for around 8-10 hours until decaffeination is complete. The direct method involves steaming the coffee beans for half an hour which results in their pores opening up which allows the caffeine to be removed after the beans are rinsed with dichloromethane or ethyl acetate for approximately 10 hours. The solvents are then washed off and drained away then the beans are steamed again to remove leftover chemical residue. The indirect method involves soaking the beans in hot water for a number of hours. The same compounds as the direct method (dichloromethane or ethyl acetate) are used to extract the caffeine from the hot water that the beans were soaked in. These compounds are then evaporated to separate the caffeine and it is then disposed of. The same water is then re-used with a new batch of beans and, after a number of cycles, an equilibrium is reached, meaning that the water and beans have a similar composition (excluding caffeine). This equilibrium allows the water to only extract the caffeine meaning that the strength, colour and flavour of the coffee all remain in the bean. If you were to decaffeinate coffee using the triglyceride process, first you’d have to soak your green coffee beans in hot water to draw the caffeine up through the pores of your beans. You would then transfer these beans to another container filled with coffee oils that you can obtain from spent coffee grounds. Immerse them in this oil and leave them to soak. After an extended period of time, usually, a number of hours, the triglycerides located within the oil will extract the caffeine from the beans whilst leaving the flavour intact. Remove the beans from the oil then dry them and they’ll be ready to go. What Steps Are Involved in Our Decaffeination Process? Our method of decaffeination is called the CO2 process (a.k.a. supercritical fluid extraction) and what it involves is, soaking coffee beans in water, causing them to double in size. The beans are then transferred to a tank that is sealed and ‘supercritical’ CO2 is then pumped into the coffee at extremely high pressures to remove the caffeine from the beans, as the caffeine dissolves into the carbon dioxide. The great thing about this method is that it doesn’t involve using any potentially harmful chemicals in the extraction process such as dichloromethane or ethyl acetate, so you don’t have to worry about any poisonous material entering your system. Addiction – You may or may not know that, technically, the caffeine compound is a drug and can become addictive. You may become reliant on the substance and a lack of caffeine can lead to withdrawal symptoms such as headaches. This is, of course, in some extreme cases and is by no means necessarily likely to happen to everyone. Heart Problems – Caffeine as a drug is a stimulant, it triggers an increase in heart-rate and this is not something those who have a high-blood pressure can afford to have. It can genuinely increase the likelihood of you suffering from a heart attack if you regularly consume coffee with a high blood pressure. Insomnia – As mentioned above, caffeine boosts your heart rate which will, in turn, keep you awake at night. Lack of sleep comes with a plethora of its own negative side effects such as; decreased levels of energy, increased stress levels and many more. Jitters – Some people are sensitive to the effects of caffeine and ingesting caffeine can cause their body to shake. However, even if you’re not sensitive to caffeine, those who drink too much of it are also at risk of experiencing the ‘jitters’. Drinking decaf coffee will protect you from above-mentioned side-effects. Having said that, some of us do like a coffee-with-a-kick to help us through the day. As long as you aren’t dependant on, and/or over-drinking caffeine – you’ll be fine. Where Can I Buy The Best Decaf Coffee? If you’re looking to get your hands on some decaf coffee, then you’ve landed slap-bang on where ‘X’ marks the spot. Here at the Real Coffee Bag Co. we’ve got a fantastic decaf blend for you called The White Blend. 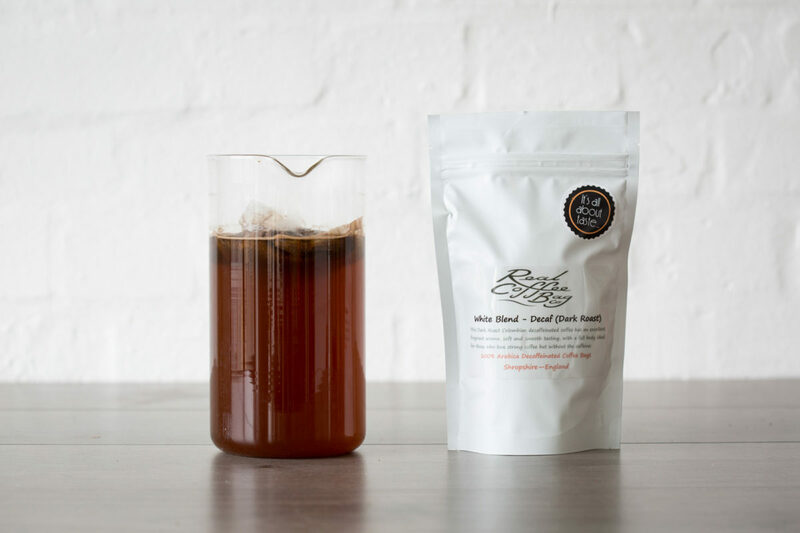 It’s a delicious dark roast coffee suitable for before bed or any other time of the day. Follow the link to our White Blend Decaf Coffee or, alternatively, browse our full selection of coffee here.